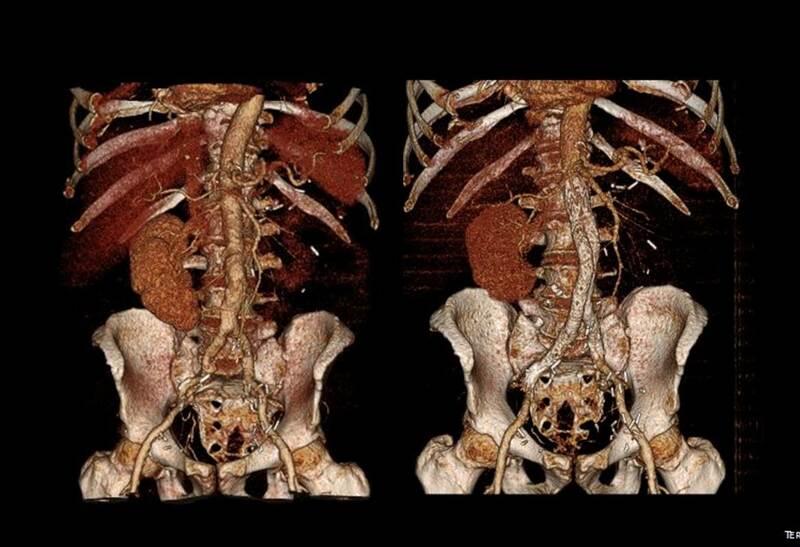 The patient is an 65 year old man with a growing right common iliac artery aneurysm of 3.7cm, a small AAA, and severe COPD (not oxygen dependent, FEV 1.5L) . He had a prior left nephrectomy for cancer as well as a bladder resection and prostatectomy with an ileal conduit (Indiana pouch or neobladder), with complex abdominal wall closure complicated by infection of Marlex in the past, and prior operations for small bowel obstruction. He is morbidly obese. His kidney function was stable with a Cr 1.5dL/mL, calculated GFR or 44mL/min. His nuclear cardiac stress test (pharmacologic) was normal. 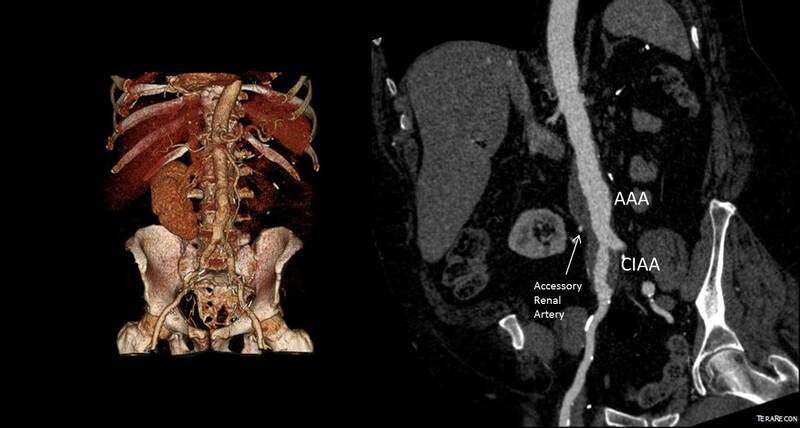 He needed to have his right CIAA treated but the issues were what to do with his accessory renal artery. Vascular surgery is all about making the right decisions with fall back plans. As with most complicated patients, the options are numerous. Open retroperitoneal repair –Left sided approach. I informally polled my partners and found an absence of consensus except for rejecting #1, 2, and 7. The first two options were not optimal because of his prior operation and because of the location of his disease. The third option had its proponents, but I felt that the kidney and pouch were in jeopardy from dissection in that area. The open debranching had its appeal for others, but for the same reasons that I rejected #3, I rejected #4 –potential harm to the kidney. #5 may be an option, but in my experience, I have seen too many patients referred for failure of parallel grafts to feel secure about offering it. #6 would be reasonable if the patient could avoid dialysis. With a calculated CGF of 44ml/min, losing half the remaining kidney would barely leave him off dialysis. By appearances though, the smart money was on losing less than 50% but more than 20%. A 30% loss would result in a GFR of 30mL/min or a Cr of 2.1 which made dialysis not likely. In my experience, the kidney does have some collateralization as evidenced by backbleeding of accessory renals with an infrarenal clamp so it may be that he might lose only 10-15%. I discussed all of these options and medical management with the patient who agreed to proceed with option 5 under my recommendation. My plan was to assess the flow from the accessory renal and proceed if it was small, with plan B being a parallel graft, plan C debranching. 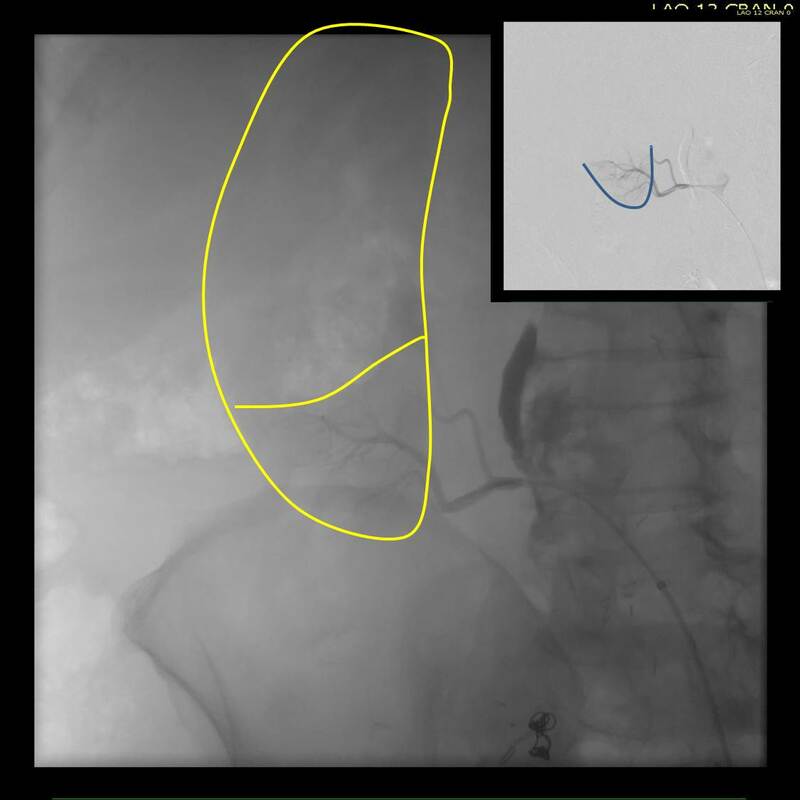 In the OR, the right accessory renal artery was selectively catheterized and a nephrogram revealed that it supplied less than 20% of the kidney. The above diagram shows the extent of the total kidney and the area perfused by the accessory renal artery. I proceeded with coil embolization of it and the right hypogastric artery and EVAR of the AAA/R.CIAA. In followup, the patient had a Cr of 1.7mg/dL, representing about 15% loss of kidney function. As the case was done percutaneously, he only had 1cm incision in both groins, and was pleased with his result. No endoleak was seen (CT above). 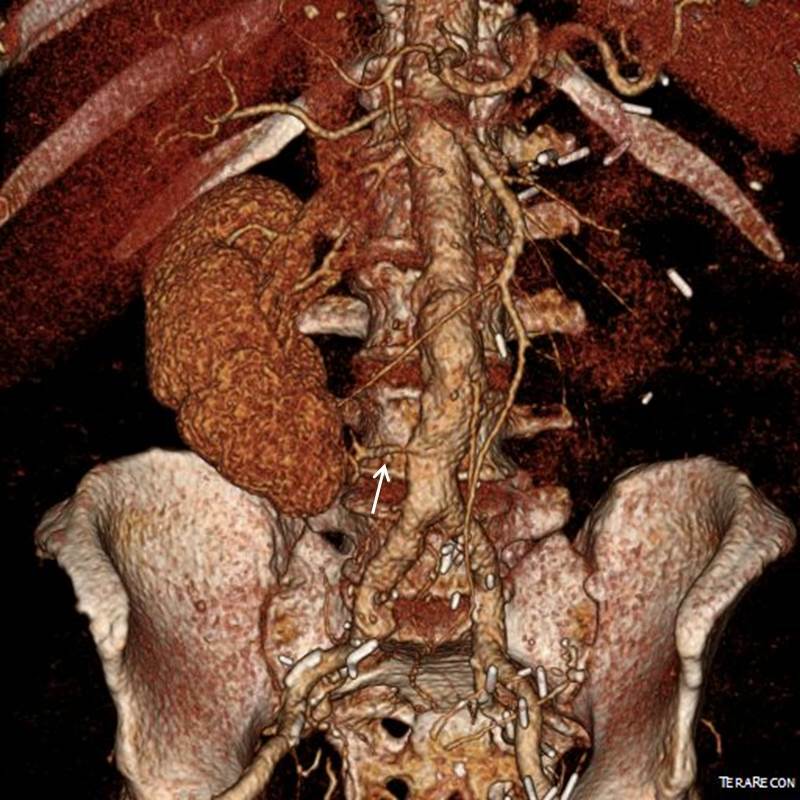 The telling lesson about this case is that at the time of initial consultation, my first instinct was to prepare the patient for open repair via a right retroperitoneal approach with debranching of the right accessory renal artery as a fallback position. Open surgery is my fallback as it was the foundation of my training. But experience has also taught me that patients with multiple comorbidities often struggle to recover from big operations even if one particular problem is not prohibitively severe. Finally, having smart partners to bounce ideas off of is a not only a luxury but a critical asset.